Markets remained mostly flat during yesterday’s trading session following an EIA report that showed minimal draws compared to the large draws estimated by the API report. Despite the rather disappointing inventory report, crude kept its strength throughout the day and closed 16 cents higher than its opening price. This gain can be partly contributed to the fact that crude inventories have drawn for 8 consecutive weeks to reach their lowest levels since August 2015. 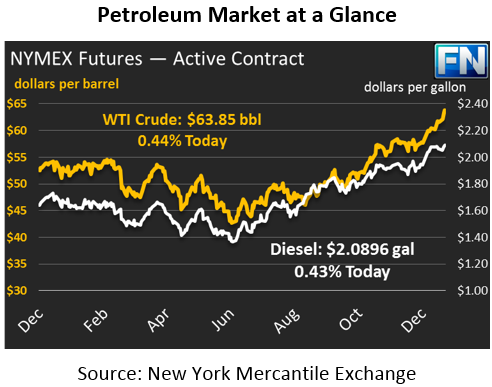 Today, crude prices are continuing to push higher, with prices currently at $63.85, a gain of 28 cents (0.4%) over yesterday’s closing price. Refined products ended the day with mixed results on Wednesday. Diesel prices saw little movement overall, gaining only 29 points from open to close. Today, diesel prices are currently trading at $2.0896, up 89 points from yesterday’s close. Gasoline fell yesterday by 1.24 cents to end the day lower. Prices are up this morning, however not enough to fully recover from yesterday’s losses. Gasoline is trading at $1.8375 currently, a gain of 48 points (.26%) since its closing price on Wednesday. The EIA released their weekly inventory data, which showed less than expected crude draws relative to the API report along with large product builds. Crude drew 4.9 MMbbls last week thanks to a large drop in production and lower imports. OPEC imports were nearly 500 kbpd lower according to the EIA report, while US crude production fell 290 MMbpd due to cold weather disruptions. These factors combined with the 8th consecutive draw in crude inventories provided strength for WTI prices. Products posted strong builds that were more in line with the API report, despite a decline in production. Stocks rose by 4.1 and 4.3 for gasoline and diesel respectively. Refinery utilization is 95.3% (down from 96.6% previously) due to lower crude imports last week, and is expected to continue its decline due to frigid winter weather and scheduled winter-spring maintenance.